Chicago Steak Company, online a mychicagosteak.com, is your source for the world's finest steaks and beef. Chicago Steak Company offers a tender and juicy selection of USDA Prime, Black Angus, Premium USDA Choice steaks, dry ages steaks, Kobe-Style steaks, Chicago style baby back ribs, ham roasts, turkey, gourmet cheesecakes, filet mignon, gourmet steak burgers, seafood, deserts, holiday entrees, and much more. Chicago Steak Company puts care into their packaging and delivers straight to your door. But before you shop, get all the latest mychicagosteak.com discounts, Chicago Steak Company promotions and Chicago Steal Company coupon codes found here at RetailSteal.com. Chicago Steak Company packages items to ensure products arrive cold and in excellent condition. Chicago Steak Company ships within the United States, including Alaska and Hawaii. See site for shipping options and rates. Save 15% on all orders from Chicago Steak Company. Click here and use coupon code to save. Enjoy a $20 discount on all purchases from Chicago Steak Company when you enter our coupon code at checkout online today. Enjoy a free gift from Chicago Steak Company. Use coupon code on purchases $119+. Save 15% on ham, turkey, and roasts using this coupon code at Chicago Steak Company. Click here to save on delicious gourmet meats. Enjoy free shipping on your entire order from Chicago Steak Company when you use this coupon code on orders of $99+. 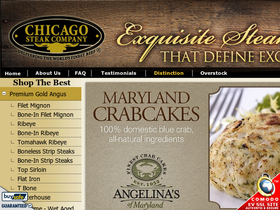 Get 12 free Angus Steak Burgers from Chicago Steak Company when you use this coupon code online. Use code on orders of $75+ to qualify. Save up to 50% on overstock steaks and beef from Chicago Steak Company. Click here to enjoy. Enjoy free shipping on many mouth-watering steaks and entrees from Chicago Steak Company. Click here to shop. Shop Chicago Steak Company and enjoy gourmet free gifts with select purchases. Click link to shop today. Save 10% on purchases of $99 or more when you enter our coupon code online at Chicago Steak Company today. Save 10% on your Chicago Steak Company with this promotional code! Offer valid on orders of $99 or more. Enjoy 3 lbs. of Tenderloin Tips free of charge when you spend $99 or more on your next Chicago Steak Company order! Save $10 on you're Chicago Steak Company purchase when you use this promotional code at checkout! Offer valid on orders of $75 or more. Enjoy free shipping on your Chicago Steak Company purchase of $129 or more with this promo code! Receive 4 free cold water lobster tails with your Chicago Steak Company purchase of $175 or more with this coupon code! Enjoy 6 free top sirloins from Chicago Steak Company when you spend $99 or more and use this promotional code! Shop sale items at Chicago Steak Company online today and enter our coupon code at checkout to save an extra $30 on merchandise.